A copy of Shelley's long-lost "Poetical Essay" ("On the Existing State of Things") in support of radical journalist Peter Finnerty, published 1811, reccently showed up at auction and was purchased by a London bookseller. This story in the TLS provides useful context. Recently Romantic Circles' Poets on Poets section, edited by Tilar Mazzeo, was lucky to be able to post recordings of Shelley poems performed by poet Anne Waldman. For one, a political ode by Shelley written in 1819 in the aftermath of the Napoleonic wars and European restorations, Waldman reads accompanied by music. For the other, Shelley's "Ode to the West Wind," she alters her voice with interesting echo effects. British Academy Symposium: "Romanticism and Science"
The British Academy is hosting a one-day symposium on "Romanticism and Science," in association with the British Association for Romantic Studies to be held on 15th September 2006 at the British Academy, 10 Carlton House Terrace, London, SW1. All are welcome. In the past, Romanticism has been seen as opposed to science, held as promoting the transcendental and otherworldly above the material and physical. This symposium seeks to interrogate this view, exploring a time before the sciences and the arts had been divided into "two cultures." Science pervaded every aspect of Romantic life and literature, as the secondary object of exploration detailed in travel narratives, the emergence of new print technologies, the use of anatomy in religious arguments for evidence of Design in nature, or physiological accounts of the effects of an encounter with the sublime in aesthetic theories. The speakers in this symposium will challenge traditional notions of Romanticism, revealing that even the most canonical Romantic writers were aware of and interested in scientific knowledge and discoveries. CFP: "The British Periodical Text, 1796-1832"
A one-and-a-half-day conference organized by the Department of English, taking place in Bristol on Thursday 28th and Friday 29th September, 2006. "Is there no stopping the eternal wheels of the Press for half a century or two, till the nation recover its senses? Must we magazine it and review [it] at this sickening rate for ever? Shall we never again read to be amused? but to judge, to criticise, to talk about it and about it": "Lepus" (Charles Lamb), "Readers Against the Grain," The New Times (January, 1825). We welcome papers discussing any aspect of magazine publication during a period marked by a highly prolific, competitive, and innovative milieu. Subjects could include: the city, the country, and the periodical; modes and uses of advertising; the general cultural status of the periodical; juxtapositions of worded and visual texts; cartoons and satire; travel writing and foreign correspondence; the commercial and other implications of technological innovation; inter-periodical rivalries and disputes; reporting the war; the periodical and reform; sport and leisure and the periodical; the critical issues surrounding periodical texts later revised for book-publication. Proposals for 20-minute papers are now invited, from new scholars and established academics alike. These proposals should take the form of a title and 200-word abstract and should be submitted electronically to Simon Hull at: romantic-studies@bristol.ac.uk in the body of an email or as an attachment in .doc format. Please include institutional affiliation and position in the body of the text. A J.M.W. 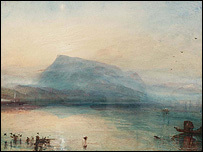 Turner watercolor, "The Blue Rigi: Lake of Lucerne, Sunrise," has sold at auction for £5.832m--a record for a British watercolour. The painting was sold to an anonymous telephone bidder at Christie's in London. A new exhibit at Tate Britain opens this month and runs through August 28, 2006: "Constable, The Great Landscapes." "This major exhibition offers the first opportunity to view John Constable's seminal six-foot exhibition canvases together. 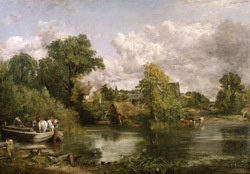 The 'six-footers' are among the best-known images in British art and comprise the famous series of views on the river Stour, which includes The Hay Wain (1820–21), as well as more expressive later works such as Hadleigh Castle (1829) and Salisbury Cathedral from the Meadows (1831)." 'Wild Irish Girls': A bicentenary conference to mark the publication of Sydney Owenson’s (Lady Morgan) The Wild Irish Girl and Maria Edgeworth’s Leonora. To be held at Chawton House Library on the 20th & 21st July 2006. Professor James Chandler, University of Chicago, ‘Edgeworth and the Edgeworthians’. Ms Norma Clarke, ‘Laetitia Pilkington: The Original Wild Irish Girl’. Dr Claire Connolly, Senior Lecturer, Cardiff University, ‘Theorising affectivity in Irish Romanticism’. The event will take place at Chawton House Library, the centre for the study of early women’s writing, which holds first editions of both novels, as well as many other editions of works by Edgeworth and Owenson. It is jointly organised by Chawton House Library and the English Department at the University of Southampton. CONFERENCE FEES: Full-time employed: £120 / Student, retired, unwaged: £65. Accommodation is available at an additional cost. Details will be on the Registration Form. CFP: "Up-To-Date With a Vengeance"
Inspired by Bram Stoker's innovative narrative forms and themes in Dracula--and in particular by Jonathan Harker's statement in his journal that he is witnessing the "nineteenth-century up-to-date with a vengeance"--this conference will explore the thoroughly modern forms of communication, technological development, and scientific discovery that emerged in the period. This conference will explore the thoroughly modern forms of communication, technological development, and scientific discovery that emerged in the period. We also encourage investigations of twenty-first century scientific and technological legacies and media representations of nineteenth-century subjects. Longer versions of INCS conference papers are regularly published in the affiliated Nineteenth-Century Contexts: An Interdisciplinary Journal. Send 250-500 word abstracts in .pdf or .doc format by December 1, 2006 to incs2007@umkc.edu. Please include your name, institutional affiliation, and contact information within that document, as well as within the body of your email. Papers are not limited to literary investigations, but their relevance for the study of literature between 1750 and 1850 should be addressed. Sponsored by the Oxford University English Faculty.